The Town Hall is one of Manchester's greatest monuments. This impressive neo-Gothic building is acknowledged as a masterpiece in its own right. 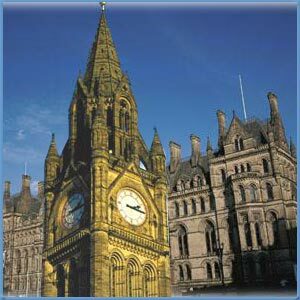 The Manchester town hall was completed in the year 1887 and rises 286 feet at Albert Square. This town hall was designed by Alfred Waterhouse, a leading contemporary architect. The hall is fitted masterfully onto an awkward triangular space. At the front main entrance of Manchester Town Hall, a statue of the Roman Governor, Agricola, finds pride of place. Being the founder of the original fort of Mamuciam, he is honoured with a statue over the main front entrance to the Town Hall. The building dominates Albert Square, which regularly serves as a venue for local events, celebrations, street fairs and Christmas funfairs. The Great Hall of Manchester is noted for its famous murals. Also notable is the elegant and dignified entrance hall, with its numerous busts and statues of city fathers and benefactors, as well as the figure of the Duke of Lancaster in Roman costume. The Hall is reminiscent of a great Gothic cathedral. Within its precincts, you can find hammer beam ceilings and vaulted dark corridors lit by a large number of pointed Gothic windows. Externally, the building is decorated with carved images representing important figures in the city's history.